Each fall, students return to school and are forced to abandon their parents’ home-cooked meals for those provided by the school cafeteria. From elementary school to high school, this was often a dreaded idea, but it was easily remedied with a sandwich made from home, something to drink that was grabbed from the fridge just before class and maybe a few other items. At Dulany cafeteria, the staff works from 6:30 a.m. until 8:30 p.m. to provide nearly 1,000 meals a day. 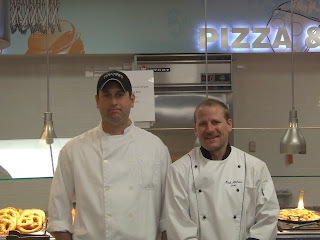 After interviewing Mark Althaus, general manager of Dining Services, and Stephen Bay, director of the Cafeteria and Campus Food Service at Columbia College, it is clear that Dulany operates much like any other business, with much consideration given to what the customers – the students – want and expect out of a meal. “Changes to the menu are an ongoing process,” Althaus said. Menu planning requires careful balancing of a series of issues: the school’s requirements for entrées provided, the amount of money they can spend, and the demand for healthy (and often unhealthy food). 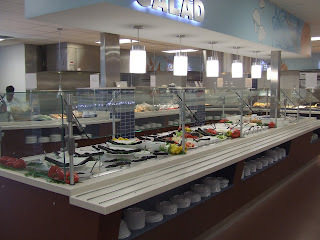 “Vegetarian foods are often requested by students,” he said, and they provide at least one vegetarian entrée each meal in addition to other items at the pasta bar. The demand for vegetarian foods has even led them to hiring a vegetarian cook. In addition, other healthy foods are often requested by students, but Althaus said when given the choice between healthier grilled chicken and fried chicken, students often choose fried. The result: Many healthy foods often go uneaten and are thrown out. Just how food much is thrown out? “Various groups have measured the amount in the past and found it to be around 50-60 pounds per day,” Althaus said. And that’s just what is left on students’ plates. The amount left behind in the serving trays is easier to control, because they have production records that tell how much food has been taken in the past. Students have voiced complaints about the Columbia College meal plan because it lacks a debit card option. In comparison with larger schools like the University of Missouri, Columbia College is clearly limited in the times when they can provide meals and the way they are provided. The greater options provided by Mizzou’s plans come at a high price, however. According to the university’s Web site, their 21-meal plan costs $3,440 per year, while Columbia College’s is $1,114 per semester (or $2,228 a year) 20-meal plan. Another feature of Dulany is the student employees. Approximately 20 students work at the cafeteria, with another seven students employed at the Cougar Café. Althaus said this is their second year with a full student staff, with about a 40 percent retention rate from the previous year. Students are welcome to work for their catering department, which operates independently of the dining hall team to ensure that there is never a shortage of workers for standard dining services. This crew, managed by Bay, can work as many as five events a day, ranging from simple continental breakfasts for meetings to 100-person events on campus. Former employee and senior Raghav Poudyal said that he would recommend working at Dulany to students. “I think it’s even more fun working there now, after the remodeling and everything,” Poudyal said. “Reading a comment card two hours after the meal has ended telling me the milk was empty doesn’t allow me to fix the situation,” Althaus said. Althaus said one of the biggest difficulties facing Dulany is communication with students. Though he estimates that half of all feedback is positive, with another 30 percent being suggestions for food items, the remaining 20 percent is often complaints he cannot remedy. Many of these involve complaints such as the milk or soda machines being out. “Reading a comment card two hours after the meal has ended telling me the milk was empty doesn’t allow me to fix the situation,” Althaus said. He says the best solution to a problem like this is for the student to tell someone working immediately, so that the problem can be fixed on the spot.